According to 4707.02 of the Ohio Revised Code (ORC), no person in the state can act as an auctioneer, auction firm, apprentice or else, without having become licensed to do so. 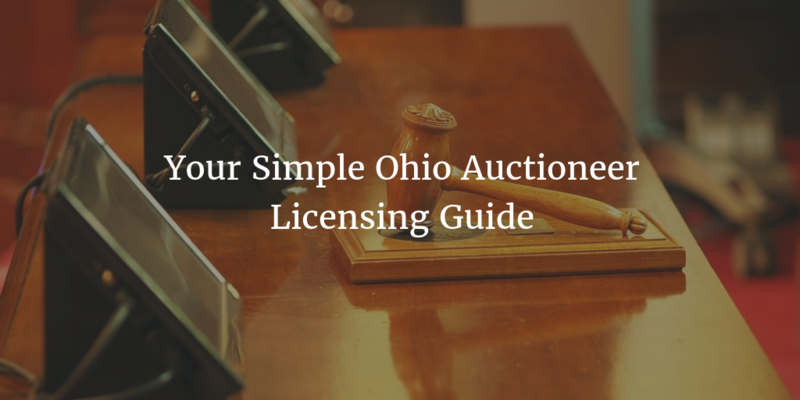 Getting an Ohio auctioneer license requires applicants to complete a number of pre-licensing requirements. This includes getting enough preliminary experience, passing an examination, as well as acquiring an Ohio auctioneer bond. Already licensed auctioneers must also fulfill some of these requirements when renewing their license every two years. Here is what applicants for an Ohio auctioneer license as well as those wanting to renew their license need to know about the process! The ORC also specifies instances in which one may qualify for a license without passing an apprenticeship – such as reciprocity agreements with other states. Auctioneer exams are held four times a year. Once you pass your exam and submit all the required form, your license will be issued by the Ohio Department of Agriculture. Current Ohio auctioneers will soon need to renew their license and bond. June 30 is the annual renewal deadline for auctioneers. During renewal, auctioneers must pay a renewal fee of $200. Along with the renewal fee, licensees must also renew their Ohio auctioneer bond, and resubmit the renewed bond to the Department. Licensing fees are biennial, which means that licenses are renewed every two years. People whose last name or the name of their corporation, partnership or association begins with the letters from A-J or X-Z must renew their licenses in odd numbered years. Those whose names are between K-W must renew in even numbered years. If you miss the June 30 renewal deadline but renew your license before September 1, you can renew your license without having to reapply. You will need to pay a later renewal penalty of $100, though, along with your regular $200 renewal fee. If you fail to renew by September 1, you will need to reapply for your license from scratch. The auctioneer bond is an important part of the licensing process for Ohio auctioneers. It serves as a guarantee that auctioneers will perform their services honestly and in compliance with the ORC and other state regulations that apply to them. The bond’s cost is determined on the basis of an applicant’s personal finances, and in particular their credit score. The cost is determined on an individual basis but is typically within a small percentage of the total bond amount. Click on the banner below to proceed with your surety bond application and get a free quote on your bond today! Start your auctioneer bond application. 100% money-back guarantee!